273 Beacon is located on the south side of Beacon, between Dartmouth and Exeter, with 271 Beacon to the east and 275 Beacon to the west. 273 Beacon was designed by Peabody and Stearns, architects, and built in 1876-1877 for merchant, cotton manufacturer, and real estate developer Charles William Freeland, for speculative sale, one of six contiguous houses built in the same style: 271-273-275-277 Beacon built ca. 1876 and 279-281 Beacon built in 1881. 271-277 Beacon form a symmetrical group, with the bays of 271-273 Beacon on the west side of each house, and the bays of 275-277 Beacon on the east side of each house. Both 279-281 Beacon have bays on the east side of the house. The original building permit application for 271 Beacon has not been located. The building permit applications for 273 Beacon and 275-277 Beacon, which were built at the same time, do not indicate the name of the architect. 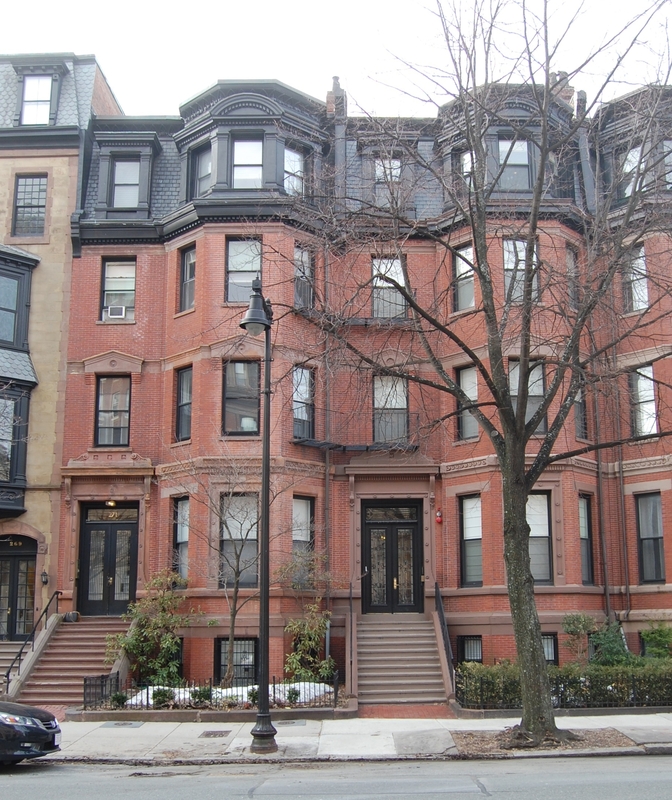 However, the permit applications for 279-281 Beacon, built for Charles W. Freeland in 1881, state that Peabody and Stearns was the architect of these houses, and it is reasonable to assume the earlier four – which are of the same design — also were designed by them (in his Houses of Boston’s Back Bay, Bainbridge Bunting indicates that all six houses were designed by Peabody and Stearns). Click here for an index to the deeds for 273 Beacon. Charles W. Freeland is shown as the owner of 273 Beacon on the original building permit application. On July 17, 1877, the house was purchased from him by leather dealer George Franklin Putnam, and he is shown as the owner on the final building inspection report, dated October 12, 1877. He and his wife, Sarah Becket (Hood) Putnam, made it their home. They previously had lived at 146 Marlborough. The Putnams continued to live at 273 Beacon in during the 1907-1908 winter season, but moved thereafter to 338 Marlborough. 273 Beacon was not listed in the 1909 and 1910 Blue Books. On October 30, 1909, 273 Beacon was purchased from George Putnam by Margaret (Homer) Davis, the wife of Charles Davis, Jr. They previously had lived at the Hotel Victoria at 273 Dartmouth, and before that at 227 Beacon. They also maintained a home in Nahant. Charles Davis (who was born Horatio Davis) was retired; he previously had been treasurer of the Atlantic Dyewood Company. Charles Davis died in 1925. Margaret Davis continued to live at 283 Beacon during the 1925-1926 winter season, but moved thereafter to the Hotel Victoria. On February 2, 1926, 273 Beacon was purchased from Margaret Davis by attorney George Marston Cushing and his wife, Grace (Littleton) Cushing. They previously had lived in Milton, where they continued to maintain a home. The Cushings lived at 273 Beacon during the 1927-1928 winter season, but thereafter again made Milton their year-round home. They continued to own 273 Beacon and lease it to others. By 1929, 273 Beacon was a dormitory for the Old Colony School. In 1930 and 1931, it was occupied by the Katharine Gibbs School. By 1932, the Cushings had converted the house into a multiple dwelling, either apartments or a lodging house. Among the residents of 273 Beacon was Rose Rochelle (Goldberg) Levin Glazer, the former wife of Reuben Levin and of Max L. Glazer, who lived there from about 1939. She previously had lived in Brighton with her husband, Max Glazer, an attorney. She was a pianist and entertainer who performed as (and later legally changed her name to) Rose Rochelle. On April 30, 1946, Rose Rochelle (as Rose Goldberg) purchased 273 Beacon from George and Grace Cushing. 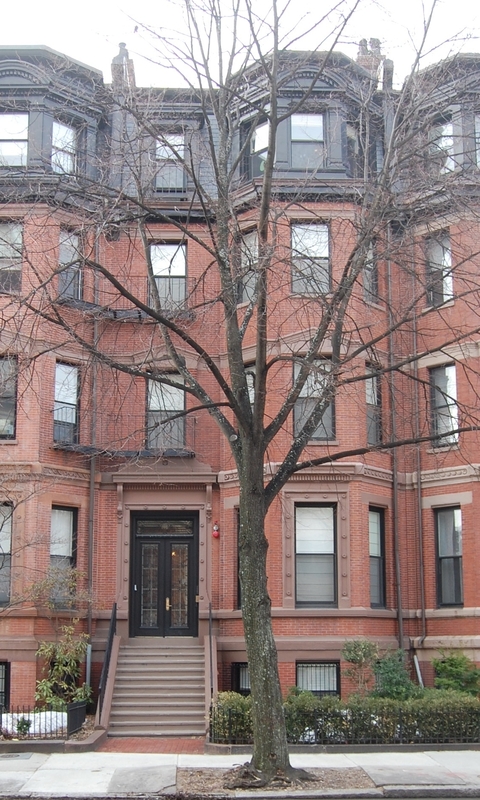 Over the coming years, she acquired several other houses in the Back Bay and South End which she operated as apartments or lodging houses, including 271 Beacon, which she acquired in September of 1955 and sold in July of 1957. On November 4, 1960, she transferred 273 Beacon and several other properties to herself as trustee of the Rochelle Realty Trust, the beneficiaries of which were her brothers, Abraham F. Goldbeck (Goldberg) and Carl Goldberg; her sisters, Evelyn (Goldberg) Nectow and Gertrude (Goldberg) Sohn; her niece, Helen Brown, the daughter of Louis Goldberg; and the children of her brother, Robert Golden (Goldberg). Rose Rochelle was married again in the early 1960s to Morris Bornstein. He either died or they separated by 1965. She continued to live in an apartment at 273 Beacon until about 1972. On June 16, 1972, 273 Beacon was purchased from Rose Rochelle by Lee Spiro Davis of Brookline. On November 22, 1974, he transferred the property to Susan Davis of Boston. In December of 1975, Susan Davis filed to legalize the occupancy as nine apartments. The Assessing Department confirmed that the house appeared as such on their records in both 1955 and 1965, and the application was granted. On November 25, 1981, 273 Beacon was acquired from Susan Davis by Lee Davis’s brother, James Spiro Davis of Newton, Chairman of the Board of New Balance shoes. On August 11, 2006, James S. Davis transferred 273 Beacon to Worcester Academy, and on January 3, 2007, it was acquired from Worcester Academy by the 273 Beacon Street LLC (James E. Keliher, manager of record). 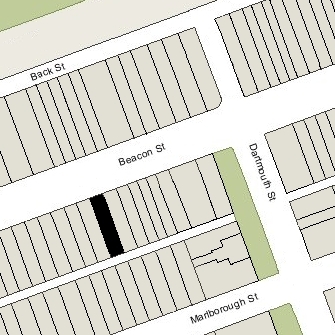 On March 13, 2007, 273 Beacon was purchased from the 273 Beacon Street LLC by the Heritor’s 273 Beacon Street LLC (Christopher Buchan, manager of record). In August of 2007 it filed for (and subsequently received) permission to reduce the number of units from nine to three. On November 20, 2008, general contractors and real estate developers John P. Holland and Joseph Holland, as trustees of the HD 273 Beacon Street Realty Trust, purchased 273 Beacon from the Heritor’s 273 Beacon Street LLC. 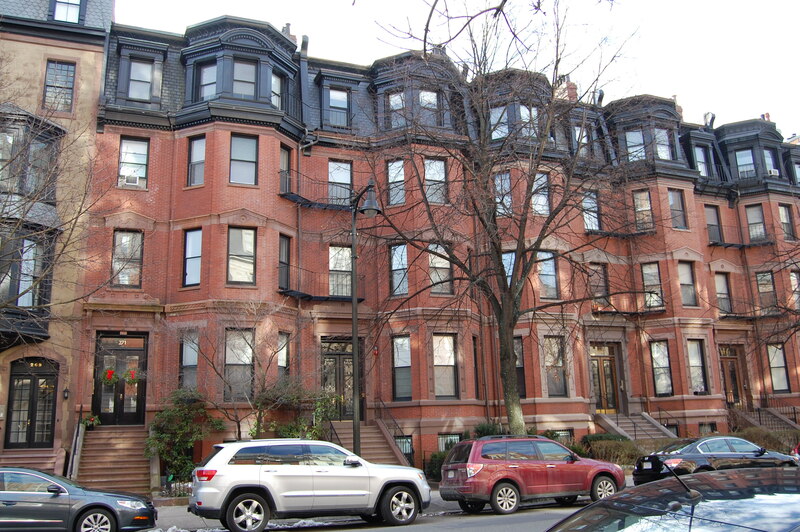 On September 17, 2009, the Hollands converted the property into three condominium units, the 273 Beacon Street Condominium.